The U.S. Census Bureau reports that Champaign is among the nation’s faster-growing cities. The (Champaign) News-Gazette reports that the city is the only one in Illinois to reach that distinction. Of the others, 74 are in California, 47 are in Texas, and 17 are in the Carolinas. From July 2014 to July 2015, the Census found Champaign grew by 1.5 percent, to just over 86,900. It’s now the 380th-largest city nationally and No. 10 in Illinois. Champaign is rapidly becoming my favorite small city. So, learn some lessons from that town and help others do some of the same sorts of things. Not everything can be duplicated, of course, but this ain’t rocket science. 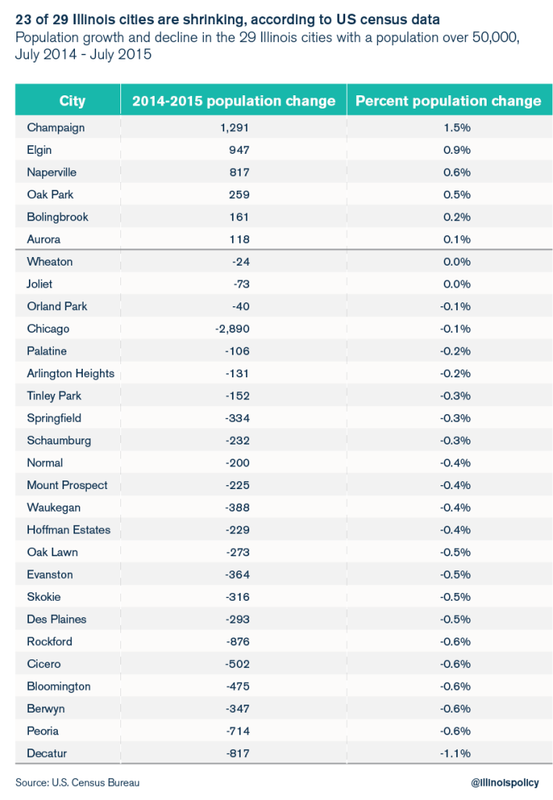 The majority of Illinois’ large cities are shrinking, according to new data released May 19 by the U.S. Census Bureau. The census data consider all American cities with populations over 50,000 and show how much those cities grow or shrink year-over-year, comparing July 2014 to July 2015. Chicago topped Illinois’ list for population decline – the city lost 2,890 people on net, the second-worst population decline in the country. Only Detroit’s decline of 3,107 people was worse. There are 758 American cities that have populations greater than 50,000. Of these cities, 629 grew, and 129 shrank. Illinois has 29 cities with populations greater than 50,000, and of these, six grew and 23 shrank. It occurs to me that it might be at least as educational to examine what is causing these 26 cities to shrink, rather than just looking at what Champaign is doing to grow. That ain’t rocket science either. But back to Champaign. How are they doing it? Rich Miller says that it’s not rocket science. But actually, in a way, it is. It’s rocket science and engineering and english and business and education and law and football. That’s because the most likely explanation for how and why Champaign is growing is because it’s home to the University of Illinois at Urbana-Champaign. Unless Rich Miller is proposing siting major state universities with enormous enrollments (UIUC’s 2015 enrollment is 40,087!) in 26 shrinking cities, from Wheaton to Decatur, I really don’t know how much there is to learn from what is happening in Champaign. Miller admits earlier in the same post that “[i]f jobs were solely based on workers’ comp costs and property tax costs, we wouldn’t have any jobs here.” As I said before, he’s right about that. Perhaps his time would be better spent applying some public pressure on Speaker Madigan to end his intransigence on this issues, rather than musing on how 23 shrinking Illinois cities can be more like a city they really can’t actually be like. After all, this ain’t rocket science.